The Bermuda Triangle, also known as the Devil's Triangle, is an area in the Atlantic Ocean where various disappearances of people and their aircraft and surface vessels have occurred. Some of the disappearances involve a level of mystery which is often popularly explained by a variety of theories beyond human error or acts of nature, attributed by some to the paranormal, a suspension of the laws of physics, or activity by extraterrestrial beings. An abundance of documentation for most incidents suggests that the Bermuda Triangle is merely a sailors' legend, later embellished by professional writers. Popular interest in the idea continues, however, reflecting the irrepressible human yearning to fathom that which lies beyond the external, physical world and interact with the realms of the imagination and spirit. The area of the Triangle varies with the authors. The legends of the Bermuda Triangle do not come from one primary source, but rather are a continuance of an older tradition of stories passed on orally before being written down. Consequently the reports are subject to any number of cultural perspectives, making it is impossible to pinpoint its exact dimensions. The most common representation is an isosceles triangle that stretches from Miami, Florida, to San Juan, Puerto Rico; and the mid-Atlantic island of Bermuda, with most of the accidents concentrated along the southern boundary around the Bahamas and the Florida Straits. Another popular theory is that it is more of a trapezium covering the Straits of Florida, the Bahamas, and the entire Caribbean island area east to the Azores. Occasionally, the Gulf of Mexico is added under this theory. Beyond the exact geographical boundaries, the general area of the Atlantic, Caribbean, and Gulf of Mexico have been heavily-sailed shipping lanes since Christopher Columbus led the way for the European involvement of the New World. From colonial trade ships to the modern day, ships cross through the triangle waters daily for ports in the Americas and Europe, as well as the Caribbean Islands. Cruise ships are also plentiful, and pleasure craft regularly go back and forth between Florida and the islands. It is also a heavily flown route for commercial and private aircraft heading towards Florida, the Caribbean, and South America from points north. The climate in that area of the ocean can be fairly extreme. The Gulf Stream ocean current flows through the Triangle after leaving the Gulf of Mexico. Sudden storms can and do appear, and in the summer to late fall, the occasional hurricane strikes the area. The combination of heavy maritime traffic and tempestuous weather makes it inevitable that vessels could founder in storms and be lost without a trace—especially before modern telecommunications, radar, and satellite technology arrived late in the twentieth century. Since humankind began to sail the oceans, there have been stories of cursed waters where ships and people disappear. These disappearances were attributed to everything from vengeful deities, sea serpents, even to the purported edge of the world, when people believed Earth was flat and a ship could fall off the edge. With the advent of modern sailing equipment and techniques, along with scientific understanding of the ocean, much of the maritime lore of earlier days faded away. A few areas remained that became designated as areas of paranormal activity, the most famous being the Bermuda Triangle. However, it is twentieth century authors who are responsible for publicizing paranormal activity in the Bermuda triangle; before books were written on the subject, there was no general understanding of a specific mysterious place in the ocean where people, planes, and ships disappeared. According to the Triangle authors, Christopher Columbus was the first person to document something strange in the Triangle, reporting that he and his crew observed "strange dancing lights on the horizon," flames in the sky, and at another point he wrote in his log about bizarre compass bearings in the area. Modern scholars checking the original log books have surmised that the lights he saw were the cooking fires of Taino natives in their canoes or on the beach; the compass problems were the result of a false reading based on the movement of a star. The flames in the sky were undoubtedly falling meteors, which are easily seen while at sea. While there probably were many occurrences after Columbus, it was not until the twentieth century that the legend became popular. The first article of any kind featuring the legend of the Triangle appeared in newspapers, by E.V.W. Jones, on September 16, 1950, through the Associated Press. Two years later, Fate magazine published "Sea Mystery At Our Back Door," a short article by George X. Sand in the October 1952, issue covering the loss of several planes and ships, including the loss of Flight 19, a group of five U.S. Navy TBM Avenger bombers on a training mission. Sand's article was the first to lay out the now-familiar triangular area where the losses took place. Flight 19 would be covered in the April 1962, issue of American Legion Magazine. The article was titled "The Lost Patrol," by Allen W. Eckert, and was the first to connect the supernatural to Flight 19, but it would take another author, Vincent Gaddis, writing in the February 1964, Argosy Magazine to take Flight 19 together with other mysterious disappearances and place it under the umbrella of a new catchy name: "The Deadly Bermuda Triangle." He would build on that article with a more detailed book, Invisible Horizons, the next year. Others would follow with their own works: John Wallace Spencer (Limbo of the Lost, 1969); Charles Berlitz (The Bermuda Triangle, 1974); Richard Winer (The Devil's Triangle, 1974), and many others, all keeping to some of the same supernatural elements outlined by Eckert. There are hundreds of odd occurrences, recorded over many years, that are connected to the Triangle in one way or another. Some of these are historical inaccuracies, some nothing more than legends or hoaxes, while others are truly mysterious happenings. The Ellen Austin was a cargo ship that was sailing on a southern route from New York City to London in 1881, when it came across a deserted schooner, adrift in the sea. The captain of the Ellen Austin ordered a skeleton crew from his own ship to sail the schooner to London alongside the Ellen Austin. However, the two ships were separated by a sudden, but brief storm and the schooner was never seen again. While this is a famous Triangle story, many have pointed to the inconsistencies that are evident when tracing the historic sources of the story. The incident of the USS Cyclops resulted in the single largest loss of life in the history of the U.S. Navy not related to combat. Under the command of Lieutenant Commander G. W. Worley, the USS Cyclops went missing without a trace sometime after March 4, 1918, after departing the island of Barbados. The ship and 306 crew and passengers were never recovered. There is no strong evidence to support any particular reason for this event. Storms, capsizing, and enemy activity have all been suggested as explanations. 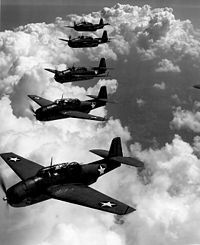 Perhaps the most famous of all Bermuda Triangle stories is of Flight 19, a training flight of TBM Avenger bombers that went missing on December 5, 1945, while over the Atlantic. Under the leadership of an experienced pilot, Lt. Charles Carroll Taylor, the routine bombing mission became anything but routine about an hour and half into the flight. Taylor radioed that his compass was not working and that he was lost. For almost ten hours, Taylor and his squadron attempted to fly north to find land, but for whatever reason could not. Eventually all radio communication was lost and search planes were sent out, one of which went missing as well. The incident was widely reported in the press, and is sometimes attributed to the genesis of the modern interest in the Bermuda Triangle. However, often left out of re-tellings are important facts—the weather became rough later in the day, and Taylor may have been confused about the origination of his flight and therefore did not realize that by flying North he was traveling deeper into the Atlantic. On December 28, 1948, a Douglas DC-3 aircraft, number NC16002, disappeared while on a flight from San Juan, Puerto Rico, to Miami, Florida. No trace of the aircraft or the 32 people on-board was ever found. From the documentation compiled by the Civil Aeronautics Board investigation, a possible key to the plane's disappearance was found, but barely touched upon by the Triangle writers: The plane's batteries were inspected and found to be low on charge, but ordered back into the plane without a recharge by the pilot while in San Juan. Whether or not this led to complete electrical failure will never be known. However, since piston-engined aircraft rely upon magnetos to provide electrical power and spark to their cylinders rather than batteries, this theory has been considered unlikely. The Avro Tudor IV passenger aircraft Star Tiger and Star Ariel disappeared without trace en route to Bermuda and Jamaica, respectively. Star Tiger was lost on January 30, 1948, on a flight from the Azores to Bermuda. Star Ariel was lost on January 17, 1949, on a flight from Bermuda to Kingston, Jamaica. Neither aircraft gave out a distress call; in fact, their last messages were routine and both had calm flying weather. In closing this report it may truly be said that no more baffling problem has ever been presented for investigation. In the complete absence of any reliable evidence as to either the nature or the cause of the accident of Star Tiger, the Court has not been able to do more than suggest possibilities, none of which reaches the level even of probability. Into all activities which involve the co-operation of man and machine two elements enter of a very diverse character. There is an incalculable element of the human equation dependent upon imperfectly known factors; and there is the mechanical element subject to quite different laws. A breakdown may occur in either separately or in both in conjunction. Or some external cause may overwhelm both man and machine. What happened in this case will never be known and the fate of Star Tiger must remain an unsolved mystery. SS Marine Sulfur Queen, a T2 tanker converted from oil to sulfur carrier, was last heard from on February 4, 1963, with a crew of 39 near the Florida Keys. Marine Sulfur Queen was the first vessel mentioned in Vincent Gaddis' 1964 Argosy Magazine article, but he left it as having "sailed into the unknown," despite the Coast Guard report which not only documented the ship's badly-maintained history, but declared that it was an unseaworthy vessel that should never have gone to sea. The nuclear-powered submarine USS Scorpion was lost on May 26, 1968, south of the Azores while in transit home to Norfolk, Virginia, after a six-month deployment. The Scorpion has been picked up by numerous writers (including Berlitz, Spencer, and Thomas-Jeffery) as a Triangle victim over the years. The U.S. Navy believes that a malfunctioning torpedo contributed to her loss, while others theorize that it was destroyed by the Russians in a secret confrontation. The general mystery surrounding the Bermuda Triangle has led many to attribute paranormal phenomena as being responsible for all the disappearances. Some have suggested that the remains of the legendary civilization of Atlantis are located within the Bermuda Triangle's boundaries. It is believed that the Atlantians possessed superior technology that is still active and causes ships to sink and planes to crash. The discovery of rock formations called the "Bimini Road" is often cited as evidence of this theory. Another popular theory is that extraterrestrials are abducting planes and ships, or that their activities are indirectly causing the disappearances. 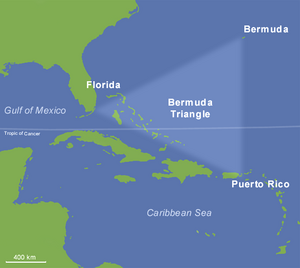 Others have suggested that the Bermuda Triangle area is an anomaly of space and time in which planes, ships, and people are sucked into a vortex that transports them to different times, and possibly even different dimensions. While there are many well-intentioned people looking for paranormal explanations for the Bermuda Triangle, none of these theories are well supported by the evidence. Research into the alleged paranormal phenomena of the Bermuda Triangle is not taken very seriously, and is often not done within a legitimate academic setting. A further obstacle is the lack of contemporary disappearances and the difficulty of analyzing infrequent occurrences over a wide range of space and time. There are many who discount anything mysterious happening at all in the Bermuda Triangle, offering a wide range of explanations for the many disappearances that have occurred. Most scientists look at the lack of any kind of evidence to suggest paranormal activities as the most compelling reason to dismiss such claims. The U.S. Navy and Coast Guard, who operate consistently within the Bermuda Triangle, have noted the mysterious disappearances but are skeptical of any paranormal activity. Some researchers go so far as to suggest that the Bermuda Triangle is a manufactured story, a conglomerate of anecdotes and rumors that do not necessarily belong in the same category, only becoming so because of poorly researched literature and the increasing popularity of the supernatural during the twentieth century. Skeptics point to the fact that there are very plausible explanations for all the mysterious events claimed to have occurred in the Bermuda Triangle. Compass problems are one of the often cited phrases in many Triangle incidents. it is possible that inexperienced people operating boats and aircraft misread the compass, veered course to adjust, and became lost. Hurricanes, freak waves, and the strength of the Gulf Stream have all been cited as naturally occurring reasons for why ships and planes have been lost. It was not until the latter half of the twentieth century that technology supported searching the ocean's depths, but even so it is very difficult to locate a submerged craft. Finding planes and ships that disappeared many years ago, without specific coordinates, is comparable to the proverbial needle in a haystack. Human error, combined with natural phenomena, has been documented as the most common cause of a plane crash or ship wreck and therefore is the most compelling explanation for the disappearances in the Bermuda Triangle. This is supported by the fact that in recent years the number of lost ships and planes has gone down drastically as transportation technology has greatly improved. The Bermuda Triangle has taken its place among the great mysteries in pop culture, having been linked with aliens, The New Age Movement, and mysterious creatures such as Bigfoot and the Loch Ness Monster. It is popular in literature, television, and films, often used as a portal device through which people are transported to other realms or times. ↑ Strange and Paranormal Activity, Bermuda Triangle (2001). Retrieved June 25, 2007. ↑ Vincent H. Gaddis, The Deadly Bermuda Triangle (1964). Retrieved June 25, 2007. ↑ L. Kirk Hagen, Strange fish: The science fiction of Charles F. Berlitz, 1913-2003 (2004). Retrieved May 19, 2007. ↑ Gian J. Quasar, Ellen Austin (2006). Retrieved May 19, 2007. ↑ U.S. Navy History, "USS Cyclops" (2001). Retrieved May 19, 2007. ↑ Lee Krystek, The Un-Mystery of the Bermuda Triangle (2006). Retrieved May 19, 2007. ↑ Answers.com, NC16002 disappearance (2007). Retrieved May 19, 2007. ↑ Gian J. Quasar, The Tudors (2006). Retrieved May 19, 2007. ↑ Time, The Queen With the Weak Back (1963). Retrieved May 19, 2007. ↑ Ed Offley, "The USS Scorpion—Mystery of the Deep" (1998). Retrieved May 19, 2007. ↑ Kenneth F. Wright, Bermuda Triangle Time-Space Warps (2000). Retrieved May 19, 2007. This page was last modified on 26 March 2016, at 19:44.